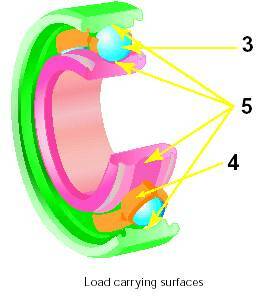 Note: Radial loads exerted on the ends of the shaft, outside of the two bearings supporting the load (i.e. the belt tension, pulley weight and propeller weight), are compounded by a lever affect and are referred to as overhung loads. Axial loads originate from the wind (E) induced by the propeller rotation. Combination loads are the result of both radial load(s) and axial load(s) being combined and exerted on a single bearing. To ensure a define load carrying capacity of ball and roller bearings for a given application, it is essential to have a clear idea about the running speed, the size and direction of the loads and the designed expectation of life. The magnitude of load is always influenced by the running speed. For every bearing number its maximum load carrying capacity is specified, corresponding to various running speeds. This load carrying capacity is considered to be valid only for the bearing having normal dimensional and running accuracy, proper methods of lubrication and a speed which yields a life expectance of approximately 5000 running hours. Balls have been defined previously as one of the essential bearing components.They are subjected to the full brunt of the load carried by the bearing. If ball and roller bearings are subjected to high temperatures in service, their load capacity is reduced as a result of softening of the race rings and rolling elements. Once it occurs, the effect is permanent, as the material does not regain its original hardness even if the temperature drops. Under normal conditions, cages carry very little load. However, when a bearing is not installed properly, is subjected to loads and speeds higher than recommended by the manufacturer, does not maintain proper lubrication, etc., the cage then may be subjected to loads far beyond what it is able to carry. These conditions can lead to premature cage failure. Raceways are the large, honed (highly polished), track surfaces on the inside of the outer ring (referred to as the outer raceway) and the outside of the inner ring (the inner raceway), that form a closed circle around the circumference of the ring. As the bearing rotates the rolling elements run on these surfaces. Considering the other factors, the load should always be determined as accurately as possible, particularly with respect to its magnitude and direction. Because it exerts a decisive influence on the life of the bearing, it is very important to take into account of all the force acting on the bearing. When a bearing is supporting a radial load, the load is distributed through only a portion of the bearing—approximately one-third (1/3)—at any given time. 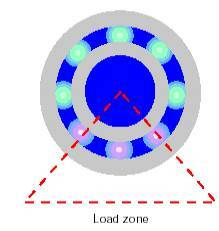 This area supporting the load is called the bearing load zone.